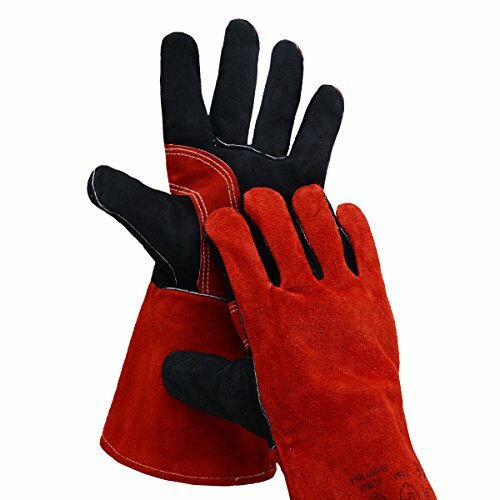 BOWOO Leather welding gloves -Our welding gloves are durable, heat-resistant, and dexterous.The gloves are the most valuable welding gloves in the market compare the price with the quality.Click the orange "Add to Cart" button and buy it to give your hands more protection!!! DURABLE MATERIAL-The external made of premium leather which is softer and more durable. The interiors are also lined with cotton for extra comfort.Bowoo welding gloves use durable kevlar double stitching ,make the gloves not easy to split. HEAT RESISTANT-Bowoo welding gloves are designed to keep your hands comfortable and protected when in contact with extremely hot surfaces. Our selection includes gloves with Kevlar stitching and a large of cuff styles to protect your wrists from sparks and heat. Choose the style that's right for you! FLEXIBLE DESIGN- The lining of gloves also provides ventilation to keep the hands at a normal temperature while working on hot welds.Reinforced wing thumb design for maximum flexibility, holding items and operate easily. If you have any questions about this product by BOWOO, contact us by completing and submitting the form below. If you are looking for a specif part number, please include it with your message.